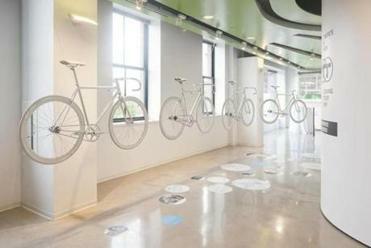 The June opening of a Boston Society of Architects bike exhibition drew hundreds of enthusiastic cyclists. BIKE PATHS, BIKE LANES, BIKE RACKS, AND CYCLE TRACKS. Bike this and bike that. Cities and towns across Greater Boston are peddling cycling construction projects this summer like never before: If it isn’t a Newton city committee proposing 30 new miles of bike lanes, it’s Malden and Everett converting downtown railroad beds into a multiuse path, or Charlestown and Jamaica Plain residents lobbying for bike improvements once antiquated highway overpasses are torn down. Meanwhile, at 698 feet, the longest bicycle and pedestrian bridge ever built in Boston is expected to open this month. The North Bank Bridge, paid for with $10 million in federal stimulus funds, begins under the Leonard P. Zakim Bunker Hill Memorial Bridge in Charlestown’s Paul Revere Park and ends in Cambridge’s North Point Park. Looping like a giant steel roller coaster over four sets of railroad tracks and a boat ramp, it is a sight to behold, whether you own a bicycle or not. Cycle tracks like this one in Cambridge will be key to attracting more riders, experts say. With so many people buzzing about biking — none louder than Mayor Tom Menino — could Greater Boston transform before our eyes into a world-class bicycling region like Copenhagen, where a third of the workforce pedals to the office each day? Is the Big Dig, which redefined the city a decade ago, already passe? Transportation planners and bicycle advocates say we’re on that path but still a long way from achieving such dreams, in part because we haven’t always pedaled forward. Hundreds of opportunities to improve Greater Boston’s bicycling infrastructure have likewise come and gone in recent decades, and in 2012, the area has a bicycling network that is hardly a network at all. Filled with interrupted paths and lanes and incomplete trails, it’s a system of stops and starts. If a bicyclist isn’t ensnared by a heavily congested intersection, it’s only a matter of time before he or she encounters a bridge without bike lanes — or a path that narrows to a point where it becomes impassable, or largely the domain of pedestrians. The new $10 million North Bank Bridge under the Zakim connects parks in Cambridge and Charlestown for bikers and pedestrians. These significant off-street bikeways — existing, planned, and wished for — would create a much-needed backbone for Greater Boston’s cycling network. Transportation planners and bicycle advocates have mapped out at least half a dozen major biking thoroughfares that could feed into downtown Boston or to the Charles like spokes to a hub (see map). But every one of those is plagued by significant gaps or roadblocks, their completion stymied by physical barriers, funding shortfalls, a lack of foresight, or political obstacles. At the same time, some of our most prominent bikeways are sorely in need of repair, with little money in city or state coffers for routine maintenance and upgrades. The Dr. Paul Dudley White Path that runs along the Charles draws thousands of bikers each week, but the Memorial Drive side is in deplorable shape, a mash-up of cruddy pavement and heaving concrete slabs shared by walkers, joggers, and bikers alike. It would cost less than $1 million to pave a dedicated bike path between the Longfellow and BU bridges, says Jeff Rosenblum, a Cambridge city planner and cofounder of the LivableStreets Alliance, a nonprofit focused on improving urban transportation. But the Department of Conservation and Recreation, the state agency that controls Memorial Drive, simply can’t spare the money to build it. David Watson, who heads up MassBike, says the future of biking in Metro Boston depends on a safe, convenient network without any gaps. IN THE UNITED STATES, there’s no better example of a city that has embraced biking than the one just mentioned, Portland, Oregon, which began painting bike lanes in the early 1990s, well before most of us even knew what they were. 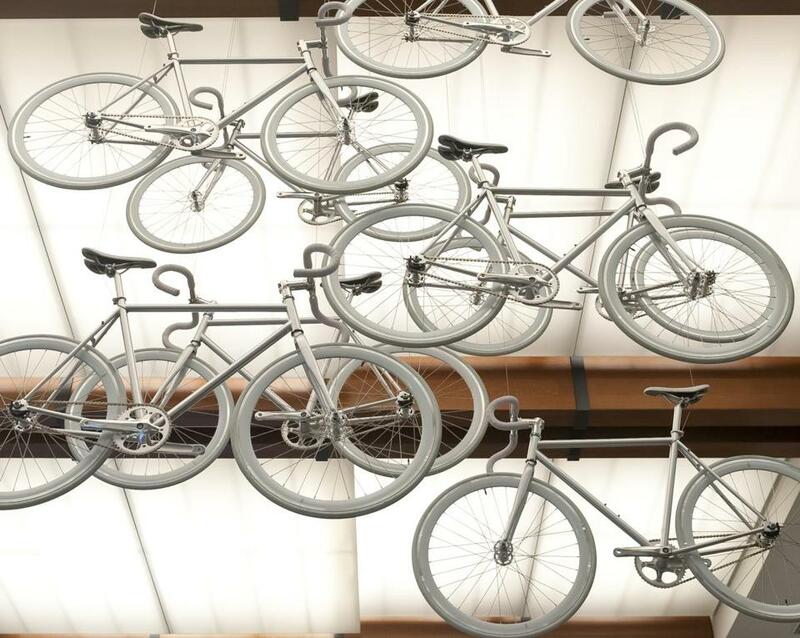 The city’s official goal is to have 25 percent of people biking to work by 2030. Roger Geller has been Portland’s bicycling coordinator since 2000 and is one of the nation’s leading urban cycling experts. For Greater Boston to become a major bicycling city, he says, it needs to fill in the missing links of its network, primarily with off-street pathways and cycle tracks — dedicated bicycle lanes physically separated from car traffic, usually by curbing. With such infrastructure, you might persuade up to 60 percent of people to incorporate bicycling into their lives, be it trips to the office, the market, or a ballgame, Geller and other experts say. Cycle tracks are key, because most people are not comfortable in a 5-foot bike lane on busy streets, Geller says. “They want a network that is completely separated from automobiles, and that’s what the world’s best bicycling cities have done. That’s what Copenhagen has done, what Amsterdam has done. That’s what Seville, Spain, is all of a sudden doing. Cities all throughout Europe are doing this.” A handful of US cities, Memphis, Chicago, and New York among them, are moving in that direction. Geller, who was an avid Boston bicyclist in the 1980s while at Tufts University, thinks Greater Boston has the makings of a great cycling center: It’s relatively flat; lots of people live within a few miles of where they work and shop or a subway station; and our weather isn’t all that bad for cycling, particularly when compared with the scorching heat Tucson, Arizona, cyclists face or the bitter winters Montreal or Copenhagen bikers endure. Boston is also benefiting from something Portland lacked 20 years ago: a national climate that recognizes cycling’s importance in reducing road congestion and pollution, as well as its affordability and health and social benefits. “I think that the pace of change can be faster today,” Geller says. Bicycle advocates say there’s a vibe about cycling in Greater Boston that wasn’t here just two or three years ago, with numerous projects and plans under discussion, a burgeoning advocacy group whose ranks include everyone from local bike manufacturers to Critical Mass disciples to politicians and municipal officials, and even a few national cycling awards for smarter planning trickling in. 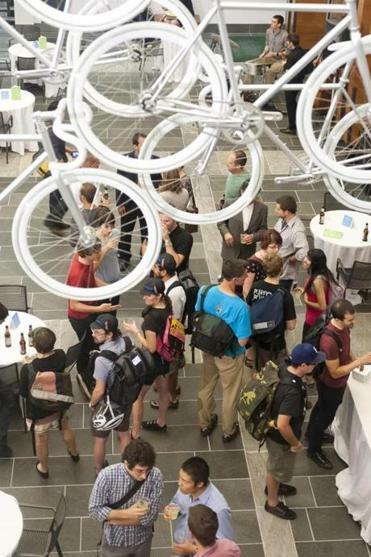 The Hubway bike-sharing program, which is expanding this summer to 72 stations in Boston and adding stations in Cambridge, Brookline, and Somerville for the first time, has garnered the most publicity. But the city, under Menino’s direction, has also added 51 miles of bike lanes to streets since 2008, created a “director of Boston bikes” position, and adopted a “complete streets” design approach, making bicycle and pedestrian access a priority whenever roads are improved. It’s also taken bold steps, such as eliminating some parking along Massachusetts Avenue to create room for cyclists. “If we’re serious about giving people an [alternative] to paying $5 for a gallon of gas, we need to provide them with the infrastructure to get around differently,” says Thomas Tinlin, head of the Boston Transportation Department. In the end, MassBike’s Watson says, the city hopes to create an extensive bike network using both off-road and on-road connections. The plan would fill in many of Boston’s gaps, particularly in underserved neighborhoods like Roxbury, Dorchester, Mattapan, and East Boston, creating feeders to the city’s major biking thoroughfares. 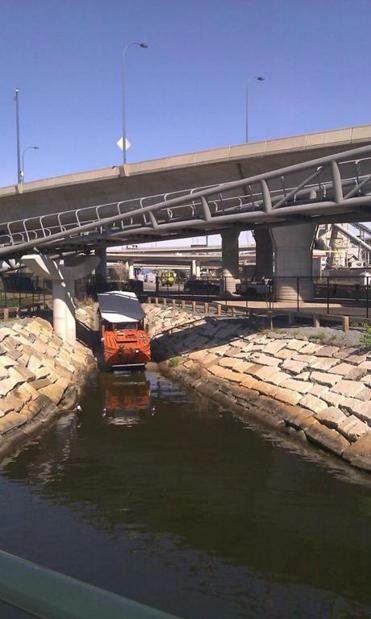 Boston’s bicycling scene is evolving in more sublte ways as well. JUST ACROSS THE RIVER, in Cambridge, more residents than ever are bicycling, with the city recording a 148 percent increase in cyclists from 2002 to 2010. Cambridge officials, who latched onto bicycling long before anyone else in Massachusetts, remain enthusiastic, adding traffic-calming measures to tough intersections, signs along certain routes that direct cyclists where to go — called “wayfinding” in bike parlance — and cycle tracks along key stretches. On Western Avenue, one cycle track will run from Central Square to the Charles and connect with another planned track on the Western Avenue Bridge that will then link with an existing track on the Boston side. “It’s about asking, ‘How do I get from my house to the river? How do I want to access this whole network?’ ” says Cara Seiderman, the city’s Bicycle and Pedestrian Program manager. Communities such as Somerville, Newton, and Arlington have also taken significant strides toward becoming bike-friendly. So has the Massachusetts Department of Transportation (MassDOT). As recently as five years ago, the state built roads and bridges primarily to improve car flow. The 2009 Transportation Reform Law, which mandated healthier and sustainable planning, has changed that. MassDOT is trying to incorporate a design approach that puts pedestrians and bicyclists on equal footing with motorists. “Most projects MassDOT is doing, right off the bat they have some consideration for bicyclists’ needs, but the challenge is to ensure that the resulting designs really respond to those needs,” says Watson of MassBike. MassDOT has reduced the number of car travel lanes on the BU Bridge and plans to do the same on the Longfellow and Anderson Memorial, with the extra space being shifted to bicyclists and pedestrians. There’s a master plan for expanding bike trails statewide, and this summer, as part of MassDOT’s strategic design for bettering the environment, called “GreenDOT,” state officials will set their first numerical goal for increasing bicycle use. “I like to kind of think, ‘Well, what would it take for my mother to bike?’ ” says Catherine Cagle, manager of sustainable transportation for MassDOT. 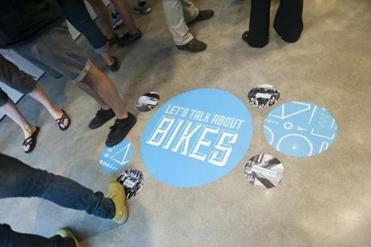 When the Boston Society of Architects kicked off its snazzy new urban cycling exhibition titled “Let’s Talk About Bikes” in June, more than 750 people came for a look, clogging congress street with the bikes they pedaled there. Change is coming from the grass-roots level as well, with dozens of local committees and groups promoting cycling. The Boston Cyclists Union is fixing bikes for free at farmers’ markets, giving bike safety talks, and promoting bike improvements in Boston neighborhoods through its “Connect the City” campaign. (Two of its priorities are an extension of the Neponset River Greenway to Mattapan Center and bike paths between the Arnold Arboretum and Franklin Park once the William J. Casey Overpass is torn down in 2014.) The Bike to the Sea citizens group is finally seeing its 20-year effort to create a bikeway to Lynn Beach begin to pay off with construction this year on Stage 1 of the trail in Everett and Malden and Stage 2 in Saugus. Other communities, such as Quincy, are looking to form bicycling master plans for the first time. Despite the obstacles, efforts to improve cycling are starting to pay dividends (see map). The biggest boost to regional cycling could be the impending emergence of the “Lost Half Mile” of the Charles between the Museum of Science and the Charles River Locks. Officially known as the New Charles River Basin, the area, once home to rail yards, potato sheds, and jail parking lots, is flush with brilliant but largely inaccessible parks paid for by the Big Dig. The first missing connector to be filled in, the North Bank Bridge, will soon link North Point Park in Cambridge to Paul Revere Park in Charlestown. Two more footbridges, one spanning the Charles, and a more complex structure that would leap over the railroad tracks adjacent to the Spaulding Rehabilitation Hospital, are in design, with funding in place to complete them by 2015, according to the Department of Conservation and Recreation. They’re not yet a done deal, but if these two bridges are built as planned, they and the new North Bank Bridge will allow cyclists and pedestrians to move almost seamlessly among the Esplanade, the Rose Fitzgerald Kennedy Greenway, and Boston Harbor, whether they’re riding from Cambridge, the North End, or Charlestown. Beyond that, the area would serve as a gateway for cyclists coming in from the suburbs. If the Somerville Community Path is extended, it will lead directly to North Point Park; Bike to the Sea users could eventually ride to the new bridges via a Rutherford Avenue trail, which the city of Boston plans to build within the next decade. For Greater Boston to become a bona fide bicycling mecca, though, it will take more than just better infrastructure, say Geller, Watson, and others. We’ll need workplaces that provide showers, developers to incorporate bike access from the street and storage racks into design plans, cooperation and respect between cyclists and motorists, police enforcement of cycling rules, bigger trail maintenance budgets, better signage, more cycling education programs, and a mental shift toward making bike trips, be they long or short, part of our daily lives. But by filling in Greater Boston’s bicycling network, even one link at a time, there’s more hope than ever that we’ll get there. Peter DeMarco lives in Somerville and writes the Globe’s “Who Taught YOU to Drive?” column. Send comments to magazine@globe.com.